Contacts: Hongqing Wang, Ph.D., Gregg Snedden, Ph.D. This study will employ a space for time substitution to show long-term effects of rising sea-level and increasing salinity on vegetation community structure, primary production and decomposition. Productivity and decomposition rates will be estimated for four wetland plant community types defined by salinity zones and dominant plant species. Contacts: Camille LaFosse Stagg, Ph.D., Sarai Piazza, Donald Schoolmaster, Ph.D., Gregg Snedden, Ph.D., Hongqing Wang, Ph.D.
Will wetland vertical accretion rates be enough to keep up with the predicted rates of sea level rise? USGS looks at soil properties and geochronology in Louisiana wetlands. The Wax Lake Delta is an ideal ecosystem to study the effects of a large-scale river diversion on the biogeochemistry of coastal wetlands, and the capacity of these wetlands to assimilate nutrients delivered by these diversions. USGS works to develop a better understanding of surface water hydrology and nitrate dynamics in this area. Diversions are currently used in the Mississippi River to stimulate delta growth via increased sediment supply. This technique may also help to reduce nutrient loads before its discharged into the ocean. Scientists at USGS assess how wetlands retain the sediment and nutrients that come from these diversions. Diversions are being used to encourage Missippi River delta growth via increased sediment availability to coastal wetlands. USGS studies hydrodynamics and sediment transport in Louisiana to better understand how marshes and deltas respond to these sediment inputs. Wetlands along the Gulf of Mexico coast play an important role in the global carbon cycle, but as they rapidly convert to open water, their potential for carbon storage is declining. USGS is working to provide accurate, long-term marsh soil carbon sequestration rates. Contacts: Gregg Snedden, Ph.D., Hongqing Wang, Ph.D.
Wetlands are often classified by their vegetation, which can help scientists track how these landscapes change over time. USGS turns to unsupervised artificial neural networks to help guide this classification process. Wang, Hongqing; Chen, Qin; Hu, Kelin; Snedden, Gregg A.; Hartig, Ellen K.; Couvillion, Brady R.; Johnson, Cody L.; Orton, Philip M.
Wang, H., Chen, Q., Hu, K., Snedden, G.A., Hartig, E.K., Couvillion, B.R., Johnson, C.L., and Orton, P.M., 2017, Numerical modeling of the effects of Hurricane Sandy and potential future hurricanes on spatial patterns of salt marsh morphology in Jamaica Bay, New York City: U.S. Geological Survey Open-File Report 2017–1016, 43 p., https://doi.org/10.3133/ofr20171016. Stagg, Camille L.; Schoolmaster, Donald R.; Piazza, Sarai C.; Snedden, Gregg; Steyer, Gregory D.; Fischenich, Craig J; McComas, Robert W.
Stagg, C.L., Schoolmaster, D.R., Jr., Piazza, S.C., Snedden, G., Steyer, G.D., Fischenich, C.J., and McComas, R.W., 2016, A landscape-scale assessment of above- and belowground primary production in coastal wetlands: implications for climate change-induced community shifts: Estuaries and Coasts, First Online, http://dx.doi.org/10.1007/s12237-016-0177-y. Snedden, G.A., 2016, Drivers of barotropic and baroclinic exchange through an estuarine navigation channel in the Mississippi River Delta Plain: Water, v. 8, no. 5, art. 184, 15 p., http://dx.doi.org/10.3390/w8050184. 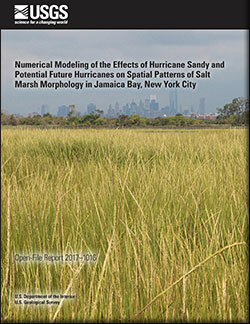 What role do hurricanes play in sediment delivery to subsiding river deltas? Smith, J.E., Bentley, S.J., Snedden, G.A., and White, C., 2015, What role do hurricanes play in sediment delivery to subsiding river deltas? : Scientific Reports, v. 5, art. 17582, http://dx.doi.org/10.1038/srep17582. Snedden, G. A., 2014, Forcing functions governing salt transport processes in coastal navigation canals and connectivity to surrounding marshes in South Louisiana using Houma Navigation Canal as a surrogate, U.S. Dept. of the Interior, Bureau of Ocean Energy Management, Gulf of Mexico OCS Region, New Orleans, Louisiana: OCS Study BOEM 2014-607, 88 p., http://www.data.boem.gov/PI/PDFImages/ESPIS/5/5411.pdf or http://www.data.boem.gov/PI/PDFImages/ESPIS/5/5410.pdf. Stagg, Camille L.; Sharp, Leigh A.; McGinnis, Thomas E.; Snedden, Gregg A.
Submergence Vulnerability Index development and application to Coastwide Reference Monitoring System Sites and Coastal Wetlands Planning, Protection and Restoration Act projects; 2013; OFR; 2013-1163; Stagg, Camille L.; Sharp, Leigh Anne; McGinnis, Thomas E.; Snedden, Gregg A.
Snedden, Gregg A.; Steyer, Gregory D.
Predictive occurrence models for coastal wetland plant communities: delineating hydrologic response surfaces with multinomial logistic regression; 2013; Article; Journal; Estuarine, Coastal and Shelf Science; Snedden, Gregg A.; Steyer, Gregory D.
Snedden, Gregg A.; Swenson, Erick M.
Hydrologic index development and application to selected Coastwide Reference Monitoring System sites and Coastal Wetlands Planning, Protection and Restoration Act projects; 2012; OFR; 2012-1122; Snedden, Gregg A.; Swenson, Erick M.
Davis, L.A.; Leonard, L.A.; Snedden, G.A. Hydrography and bottom boundary layer dynamics: Influence on inner shelf sediment mobility, Long Bay, North Carolina; 2008; Article; Journal; Southeastern Geology; Davis, L. A.; Leonard, L. A.; Snedden, G. A.
Snedden, G.A. ; Cable, J.E. 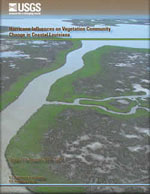 ; Swarzenski, C.; Swenson, E.
Sediment discharge into a subsiding Louisiana deltaic estuary through a Mississippi River diversion; 2007; Article; Journal; Estuarine, Coastal and Shelf Science; Snedden, G. A.; Cable, J. E.; Swarzenski, C.; Swenson, E.